If MCC owns a book or DVD that I'd like to borrow can I reserve it? If an item in the Damato Library is checked out to someone else or not available, you can request that it be held at the Circulation Desk for you. To do this, click the "Sign In" link in upper right corner of the MCC Search home page and enter your NetID and password. 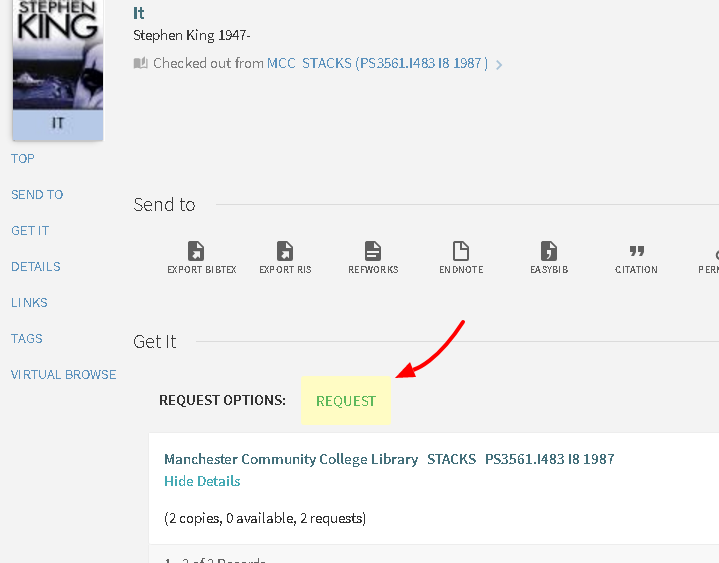 Once you've signed in, search for the item and click on the "REQUEST" button to place a hold. You'll be notified via campus email when the item is ready for pick up. Items with a status of "Available" cannot be reserved and must be retrieved from the shelf. Please ask a member of the Library staff for help, if needed.